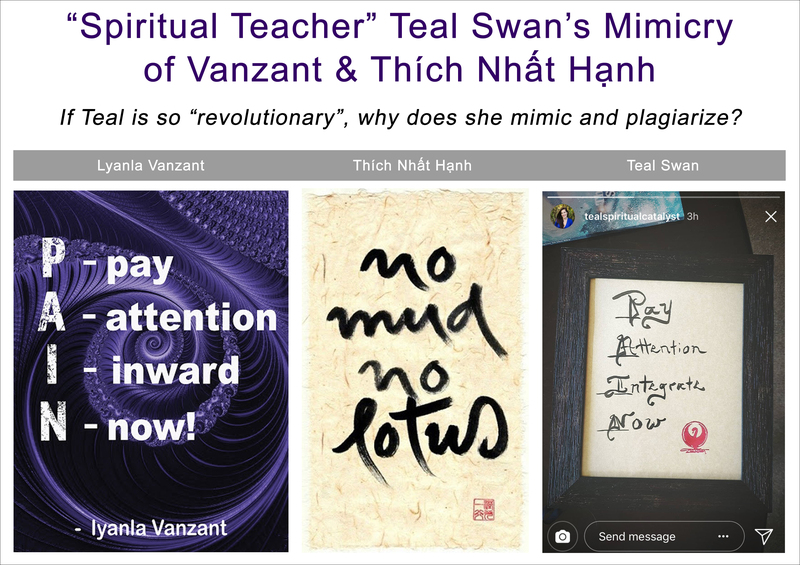 Spiritual teacher Teal Swan, who describes herself as the “Leader of an Authenticity Movement” and “Leader of the New Age”, has verbatim plagiarized from a number of authors and resource websites. It is not ethical for Teal Swan to lift others’ work, and even more concerning, receive royalties and accolades for her plagiarized material. Teal profits off of her YouTube channel, while using other authors’ material. An observer says it perfectly: “Teal has no conscience whatsoever, just steals whatever she likes in order to further herself and her agenda. Doesn’t care who she steps on along the way.” This page contains links to researchers’ websites, and a meme album for a quick overview of some of Teal’s plagiarism. Michael Brown of “The Presence Process” denounced Teal. 2018/11/10 — Plagiarism Detection – She Removed Credit To The Author!! 2018/04/25 — PART 2 of Teal plagiarizing Cooray’s book. “Cam is very disappointed” in Teal. Update: It shouldn’t take a meme to get “Authenticity Leader” Teal to cite her blogs. She (non-formally) cited the paragraph on endometriosis in her blog “The Light Is A Constant”. That said, if anyone thinks we’re just making up Teal’s plagiarism, old blogs are always archived. Ethics for a spiritual leader should mean something.